The excitation system is used to drive to 1,400 rpm for the purposes of ignition. On start-up, the Generator is turned into a motor and used to drive the Gas Turbine up to 2,700 rpm (90% rated speed). The Generator used in Aghada is a three-phase synchronous generator (also known as an alternator). The electromagetic system used here is made up of a stationery armature with three fixed coils positioned on a circular path are phased 120° apart. They are equidistant from the rotating electromagnet. 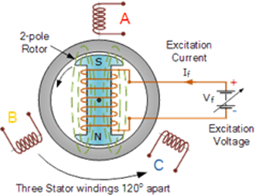 When the rotor is turning the magnetic flux for each winding (coil) is changing. While the magnet is moving away from one coil it is at the same time moving towards the next winding. 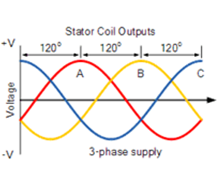 The three phases used in tandem guarantee a steady supply of electric current. The supply is synchronised with the National Grid and this concept is captured in the name of the Generator.